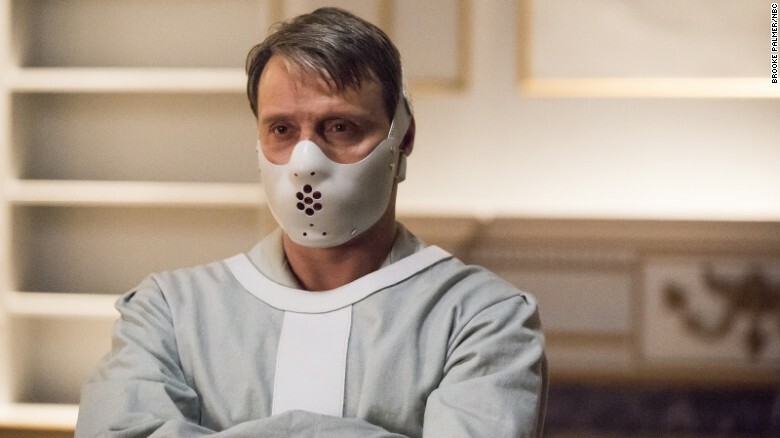 NBC's Hannibal sat down for its last supper this last week. I still haven't gotten around to watching it yet. See, I fell behind as I'm apt to do and then started binge watching the episodes from the season 1 pilot through to season 3 with my friend. I have to tell you as I'm sitting here in the midst of season 3, this now "canceled" series is a masterpiece up there with Breaking Bad. It really really is. I don't know how many times I said, "I can't believe this show was on network television and that hardly anybody has been watching it." The writing is absolutely superb, and it's not just me that thinks so. It has a 98% fresh rating on Rotten Tomatoes and reviewers from io9 to Forbes have been raving about what a good drama this show is. Hannibal is probably the greatest villain I have ever seen, and he is a remarkable creation of Thomas Harris. If you enjoy crime dramas, aren't afraid of some gruesome (and maybe a little stomach churning) scenes, and love the psychology that made Silence of the Lambs such a megahit over twenty five years ago, you owe it to yourself to watch this series. I never thought I would ever say this, but the actor that plays Hannibal in the series is better at it than Anthony Hopkins. And the series as a whole is a better tale than Silence of the Lambs could ever hope to be. For one it took the series in a bit of a new direction, however, never sacrificing the integrity of the books and the plot points that made the books so great (Yes, I've read them all). Additionally, it was a conclusive telling of Hannibal Lecter from his early days (a prequel), encompassing the events of Red Dragon, and borrowing heavily from the third book to tell Hannibal Lecter's history. What a pleasure it was (and is) to watch. If you don't know, recently Ashley Madison (a website marketing itself as a destination for those interested in having an affair) got hacked and as a result, all of its information was spilled forth for people to sift through. Caught up in the scandal are some celebrities, but Gizmodo/io9 writer Annalee Newitz went a step further and investigated the data to uncover some startling statistics that I can't get out of my head. For one, there are literally millions and millions of accounts and nearly all of them are men or fake accounts made by the employees of Ashley Madison for the sole purpose of impersonating women to perpetuate their con. 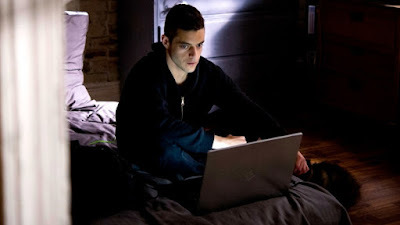 Ms. Newitz even discovered that of the female accounts that do exist, only about 1,500 were actively checking messages. This in comparison to some 33 million male accounts. I had so many questions as to what's going on here. Questions like: why is the ratio of men so high? Are men biologically programmed for deceit or is something else going on here? And if we do accept that men are biologically programmed for deceit, how would that cause you to raise a boy differently as per se a girl? Would it be harder to raise a boy to be a responsible young man so as to steer him straight from being just another future statistic on an Ashley Madison-type clone in the not-so-distant future? And then my thoughts turned to such topics as "open marriage" and "polygamy" (hey I live in Utah) and by extent "polyamory" and "open relationships." I started to wonder if the dynamics of "more than one" evolved to placate men (specifically) and not women because with so few women having active accounts on Ashley Madison, my conclusion is that most women are satisfied with their marriages. I suppose I shouldn't be shocked because the United States is a patriarchy, and as unfortunate as that fact tends to be it means that women have been placating the needs of men for centuries. It's just that I've never noticed it as much as I did when I started reading the statistics that Ms. Newitz was posting on Gizmodo. And then there are gay male relationships to consider. Long term relationships in the gay community do exist, but I would almost say they are "unicorns" in the same manner as Wall Street refers to a billion dollar startup as a "unicorn." In other words, most businesses fail, and I think the same is true of gay relationships (male not female). Why? Because they are comprised of two men and men are (as Ashley Madison statistics show) overwhelmingly deceitful. So yeah, it makes sense that long term gay relationships are rare. But what about the fraud that the website perpetrated? There's that too. I mean, Ashley Madison was perfectly marketed to its audience. It was a honey pot that attracted enough men that it generated $140 million in profits in 2014 alone. And what were they paying for? Newitz points out that the entire website was a dystopia. It billed itself as a social network but none of the members on the site could be social without paying for that privilege. You couldn't even check your messages without paying money, and it turns out, when you did you were just conversing with a bot...a fake account...meant to string you along and fleece your pockets. If you wanted to quit the site, they withheld your information unless you actually paid them to erase it (kind of like blackmail). And as it turns out, even if you paid they kept your information anyway. So the customers were liars and deceitful bastards and the owners of the website were also liars and deceitful bastards. It's just that one was "outfoxing" the other, and that I suppose is either really sad or pure genius in that it netted $140 MILLION DOLLARS. I hope some of you will read this and comment and tell me whether you too are fascinated by any of this. We sure live in interesting times. Mad Max: Fury Road is the best action movie of the summer and deserves to win the Oscar for Best Picture. world has gone completely crazy, and it's clear he's the only sane one left. Now that summer is almost over, I think I'm going to make a crazy prediction. Not only was Mad Max: Fury Road the best movie of the summer, but it could very well go on to win Best Picture at the Oscars. Yeah, I'm saying it now. Wouldn't that be insane? It's a little short on plot but what Mad Max movie isn't? And it has great reviews on review aggregate site Rotten Tomatoes with a 98% fresh rating the last time I checked. That pretty much puts it in "this is a masterpiece" territory with critical reviewers. It took me watching the honest trailer for it to fully gel this opinion (that you should take with a grain of salt), and I think if you give it a moment of your time, you'll agree that in the least Mad Max: Fury Road was the best action movie of the year. Seriously, watch the honest trailer. It's the best three minutes of your life you'll spend today. 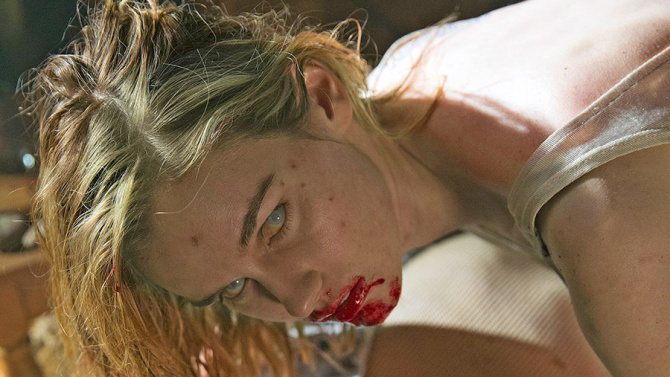 Fear the Walking Dead is already better than The Strain and it's only one episode in. 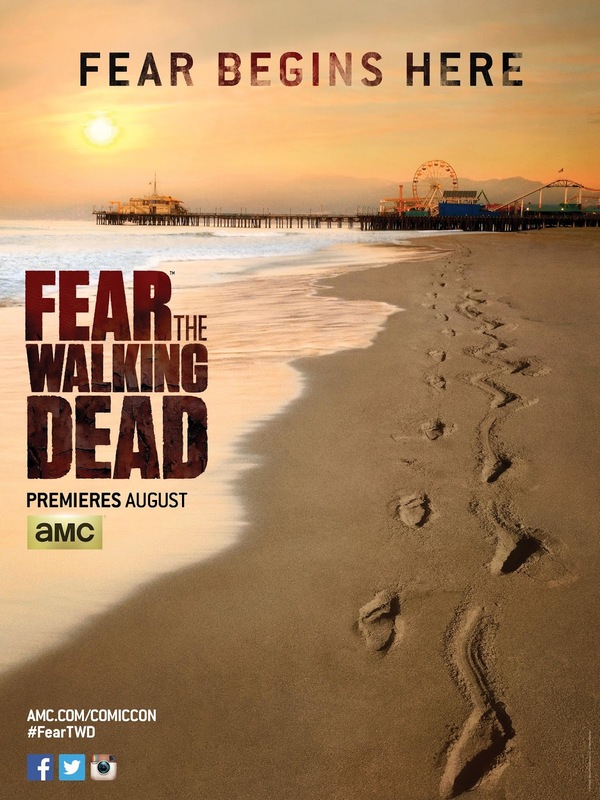 The pilot for Fear the Walking Dead was really really good. It accomplished for me what another apocalyptic undead tale, The Strain, simply fails at. In the 90 minute pilot we got introduced to a junkie named Nick Clark, who stumbles his way around a derelict church where all the other junkies have been killed and eaten presumably by his friend Gloria (a zombie) who (I think) probably overdosed on heroin and then became a walker. And although there was plenty of gore, the show emphasized suspense and atmosphere over action, and in this prequel (which takes place during Rick Grimes' coma) it really works. The thing that I love about the show are the ominous portrayal of events. A troubled student hints that something strange has started happening across the country. Then there are the horrific events that went down at the church where all the junkies shoot up. There's moody, cinematic lighting, sound, and pacing that actually had me a bit "on edge" even though I just met these characters. And then there's the traffic grinding to a halt with helicopters blaring for "all people to stay with their cars." It's the kind of thing that has just enough "down the rabbit hole" content to it to engender a sense of disquiet and unease in the audience. It's masterful storytelling, and I can't wait until next week's episode. I almost wish I could tell these characters that what they are witnessing is not just a phenomenon. It is the end of the world, and the crazy has only just barely started. These twin typhoons make me think that the Earth is smiling at the moon. Yesterday over at "The Vane," which is a blog run by the Gawker network, author Dennis Mersereau posted a beautiful gif of Earth as seen from a Japanese weather satellite that takes a picture every eight minutes. It captured the birth of fraternal twins in the Pacific Ocean, Typhoon Goni and Typhoon Atsani, and Atsani is already a super typhoon with 165 mph winds. There's something about the power of these storms that fascinates me: how the winds organize around an area of extremely low barometric pressure and relative calm (called "the Eye") and how they draw their strength from sunlight heating the ocean. The Typhoon Twins are especially serene to look at from space in this gif...they almost make a face: two eyes, a nose, and a mouth. Maybe it's the visage of the Hindu Goddess Shiva who is both creator and destroyer. I leave you with this .gif from The Vane. May you stare at it as much as me. The New York Times article on Amazon's ruthless business practices has me in a state of disquiet and asking why we let our unions die. 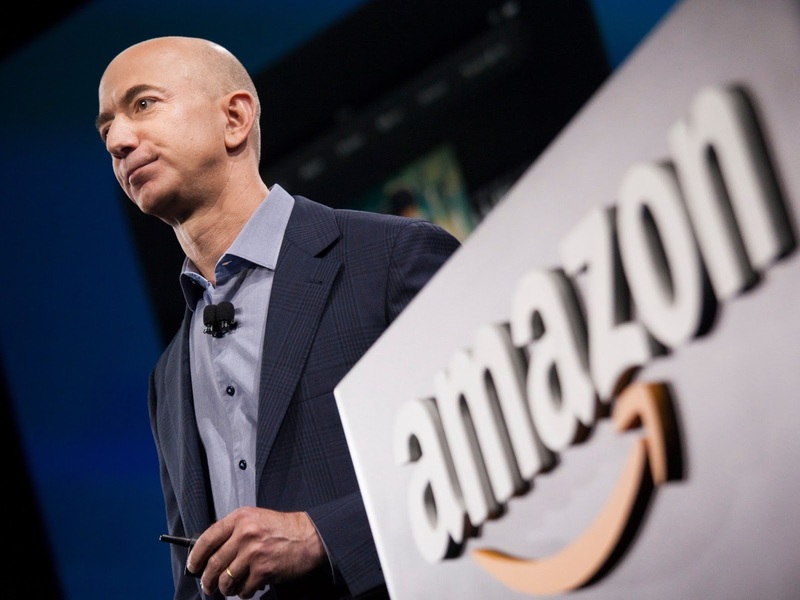 This weekend, the New York Times wrote a telling essay about what it's like to work for Amazon. If you haven't read it, you should because everyone is talking about it. When I asked some of my friends and family about the article, I got mixed responses. Some that are in management positions supported Amazon's "shock and awe" culture praising that this is how a company manages to do great things. Supporters on CNBC declared that this is nothing new, saying that what Amazon does could be from any company that wants to disrupt how things are done, e.g., Tesla, Netflix, and Uber. Making daily performance meetings so cutthroat that people leave crying and preparing for them is like preparing for a court hearing. Amazon warehouses have sophisticated electronic systems to ensure all employees are packing enough boxes every hour. In an eastern Pennsylvania warehouse, workers toiled in more than 100-degree heat with ambulances waiting outside to take away laborers as they fell. Marathon conference calls on Easter Sunday and Thanksgiving. Criticism from bosses for spotty Internet access on vacation and hours spent working at home most nights or weekends. When you're not able to give your absolute all 80 hours a week, it's seen as a major weakness. A woman who had thyroid cancer was given a low performance rating after she returned from treatment. "I'm sorry, the work is still going to need to get done," the woman said her boss told her. Another woman with breast cancer was told that she was put on a "performance improvement plan" which is code for "you're about to get fired." The reason: "difficulties in your life have interfered with fulfilling work goals." A mother of a stillborn child was told by email that her performance would be monitored to make sure her focus stayed on the job. How could anyone survive in a place like this? I can't think of a person in my social circle who wouldn't be snapped in half by Amazon and be broken and on the floor. Who the hell wants to work this hard? All of these things and more make me wonder how we got to a place like this in society. Are we living in the Matrix? Why are people selling themselves to companies like this, or is the problem that finding a living wage job has become so difficult that you've got to put yourself through this in order to live the American Dream? Is it possible that to refuse or be physically unable to compete at such a high level means you will live a life of poverty? Is that the new reality? Honestly, I had no idea what kind of company Amazon was. I feel like I'm culpable for some of this suffering too because, "Yes, I buy and sell stuff on Amazon all the time." But so do you. All of us are culpable. And here's the thing: I don't really see any kind of substitute for Amazon either. So in a way, Jeff Bezos (the Amazon C.E.O.) is the new John D. Rockefeller. My dad used to tell me about Rockefeller, and how he was a ruthless businessman that had his own private army and worked people essentially to death while he made fistfuls of cash. The only thing that was able to stop that kind of rampant capitalism were unions. But unions are basically gone now, and I think we're going to need them in the not so distant future. I really, really do. Let's just hope that this report is an outlier in the world of business and that it is not the norm. A Man from U.N.C.L.E. is delightful in a year chock full of secret agents. In a way, I suddenly feel like I'm living in the golden age of spy movies. Earlier this year I got treated to Kingsman: The Secret Service, then Tom Cruise served up a stellar Mission Impossible: Rogue Nation, and now Man From U.N.C.L.E. turned in an impressive story set (to my surprise) in the "Mad Men" era of the sixties. I never actually watched the t.v. show "Man from U.N.C.L.E." so I had no idea what to expect. 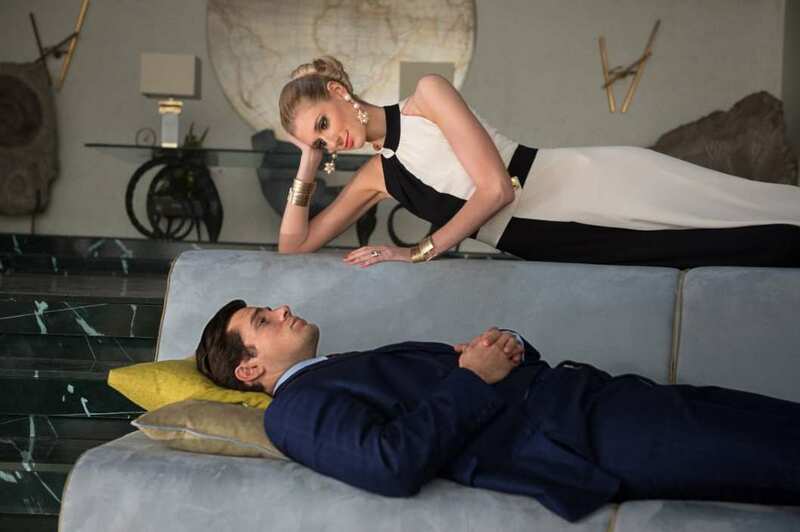 Henry Cavill as the main lead named "Napoleon Solo" was superb. He had great lines, and his talents perfectly complimented the imposing Russian K.G.B. agent that became his partner. I was wondering when they were going to explain what "Uncle" was and it didn't happen until the last five minutes, which seems like the studio behind it all is bent on creating a franchise. Personally, I'd go see another based on this one, so a franchise seems like a good move. The movie was delightful. Style is the substance in this Guy Ritchie remake, and I was surprised that there weren't "gunkata" moments like you see in the Batman or Bourne Identity movies. The bad guy (I swear) is a clone of Paris Hilton. I did a double take several times as I was watching, but my friend that went with me to the movie assured me that it wasn't Paris Hilton. The resemblance, however, was uncanny. Now I guess I have a few months to wait before the next Bond movie which has my all time favorite villain in it called, "Spectre." It looks so good. Google is now Alphabet and in that one change was all the money made for the one tech company meant to rule them all. 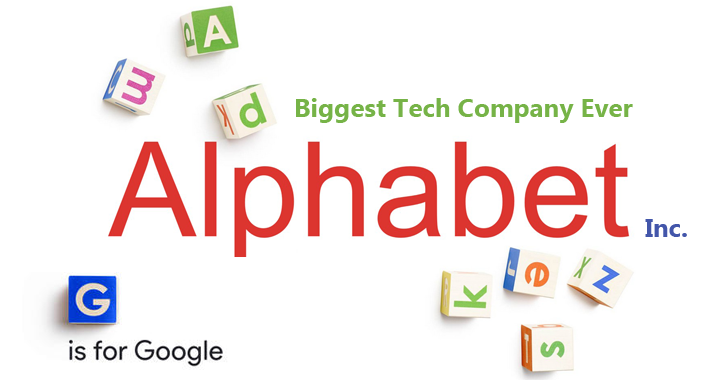 Taking a page from Warren Buffett, the young billionaires of Silicon Valley entity Google (you may have heard of this company) announced that they would be reorganizing under an umbrella company called "Alphabet." Berkshire Hathaway is essentially the same kind of entity, being a huge company that owns things like Heinz, R.C. Willey, and many other companies that Warren has selected over the years. 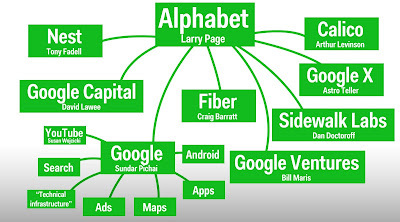 Under Alphabet's umbrella are: Google (now only a search engine company), Calico (a health effort/life sciences/longevity research company), X Lab (a mad scientist kind of company), Nest (a smart home technology company), Fiber (broadband and cable service), YouTube (a video hosting services company), Ventures (a seed and growth stage funding source for startups), Capital (a late-stage growth venture capital fund), Sidewalk (a company focused on improving city living through technological innovation), Android (phones), and a Drone Deliver Service company. Sundar Pichai was made C.E.O. of Google and Larry Page and Sergey Brin will go on to the top two positions at Alphabet. This means all Google stock will become Alphabet stock. I think this move is actually pretty brilliant. Google was becoming an enormous octopus where the bottom line of one division impacted the other and had the potential to drag it down like lobsters in a basket. It was impossible to see how all the companies figured into the whole because it was all viewed as one company. Now, each separate tentacle of the monster that is Alphabet will have to declare its own earnings and losses and it will be easy to pinpoint what makes money and what doesn't. Snip snip, cut cut, that is the way of things when it comes to capitalism. In a way, it's a lot like editing. It's why we have chapters instead of one chapter that spans 2,000 pages with no breaks. How hard would that be to edit? It'd be one hot mess. Separation of a huge company like Google creates value, transparency, and a catalyst for a capital return to all investors. I'd be remiss if I didn't say that I find the whole thing fascinating. On one hand we have a company that is exactly the same as it was yesterday, only because of the reorganization, $25 billion dollars was created in the space of just a few hours. That's pretty crazy just to think about, but it also makes me realize just how awesome it is to own a publicly-held company in America. It's illegal to print money, but it isn't illegal to print new shares of a publicly-held company. If you create value in those shares (however it is warranted) then you have your own private printing press on which infinite dollars can just roll off and into your pocket. I wish I could figure out a way to get in on that game. Sigh. As a side note, I guess I'll have to start calling the self-driving cars "Alphabet self-driving cars" instead of "Google self-driving cars." I got to admit, it's gonna take some getting used to. Fear the Walking Dead actually looks better than The Walking Dead. How is that even possible? You all know how much of a HUGE fan I am of The Walking Dead. I like the characters, the setting, zombies...what more could you ask for from an ongoing series? Everybody else seems to agree with me because The Walking Dead is a monster hit. In the world of cable shows, it's basically what Harry Potter was to young adult fiction. With only a couple weeks and counting from the premiere, AMC released another trailer with some "behind the scenes" peeks at the series from showrunner Dave Erickson and many of the cast members. What can you expect from season 1? Well it's going to take place in the time that Rick was in a coma (a period of about five weeks). But what I get from the sneak peek embedded below is a tremendous sense of dread, fear, and full on horror. It also promises to be action-packed because we all know how the world basically ends. That it ends in a mere five weeks is incredible. Imagine going from everything that we take for granted right now to five weeks later where we see the total and complete collapse of civilization as we know it. Chanie Gorkin's Bad Day poem is exactly what every writer needs to master their insecurities and appreciate the dual meaning of words. Today is the first Wednesday of August, and I thought that 17-year-old Chanie Gorkin's "Bad Day" poem might be just perfect for an Insecure Writer's Support Group post. Chanie (a soon to be 12th grader in Brooklyn) wrote the poem last year and based it on Hasidic philosophy. The reason why I think it's perfect is because the poem has two meanings. When read top to bottom it has an entirely different tone than when read from bottom to top. Anyone who writes can appreciate this dual meaning of words and how oftentimes we must force ourselves to gain a new perspective on our work to see it in some meaningful way. 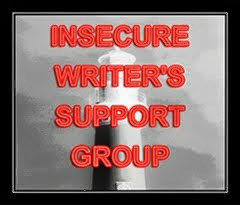 I've even heard of writers reading their own words back to front in an attempt to catch errors. Chanie's poem is brilliant and wonderful and I think every single one of us can find some meaning in what she says. After all, there is power in insecurity once we learn how to channel it into something positive. (Now read from bottom to top). I won't be posting Friday as I have a friend coming to visit from out of town (which is exciting). I'll see you Monday. Is Mr. Robot noir and if so is it a reinvention of Breaking Bad? I just figured it out: Mr. Robot is just Breaking Bad, only it's Breaking Bad for techno geeks. Elliott is the stand-in for Walter White and his slow descent into the criminal world is basically the same as Walter White's. I mean, Walter White started out slow by cooking meth for small time drug dealers and then outwitted/killed them. Elliott is essentially doing the same thing: forced to outwit the clueless drug leaders by outplaying them. What really clued me in was last week's episode where he had a gun held to his head, and he began to rattle off all the reasons that the guy holding the gun to his head couldn't shoot him. It sounded eerily familiar to something Walter White might say to Tuco or to Gus. As a caveat, Mr. Robot is not a ripoff of Breaking Bad by any means, but it certainly seems to be a clever reinvention, however intended as far as the writers are concerned. Which makes me ask the next question: is Mr. Robot noir then? From what I understand, noir is where the main character is basically an anti-hero and we are dragged along on a ride that ends in his ultimate destruction. If this is the case, then Elliott is doomed and the seasons of this show will show us his descent piece by piece (and of course his path will be littered with the bodies of everyone that knows him). We already started this in a way with Shayla's brutal death at the hands of Vera's henchmen. So what do you guys think? Is Mr. Robot noir and if so is it a reinvention of Breaking Bad? Let's hope so, because Breaking Bad was probably the best television series I've ever seen.